The SFT-110XW Supercritical Fluid Extractor (SFE) is an entry level system which possesses many features typically found in more costly Supercritical Fluid Extraction equipment. It may be used for a variety of applications from routine analytical work to basic process development. 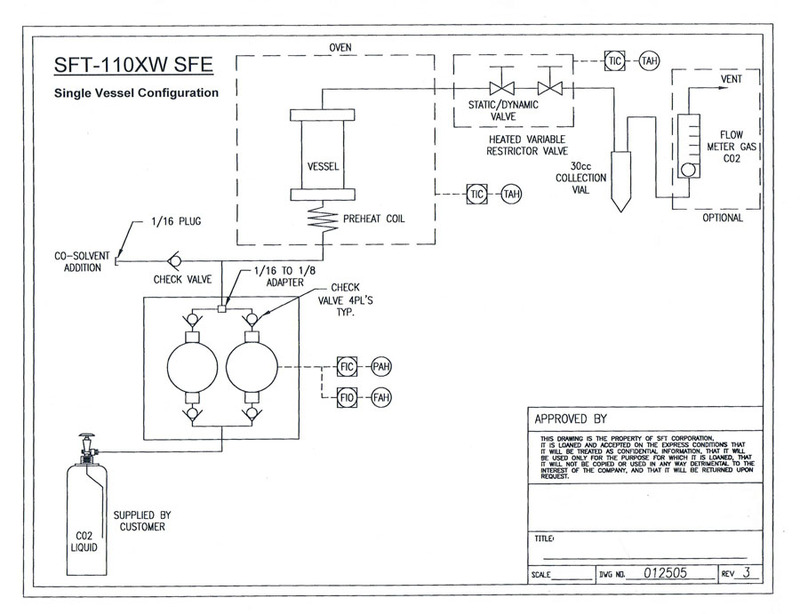 The SFT-110XW was developed for people who want to investigate the feasibility of applying supercritical fluid extraction techniques to a wide variety of analytical and processing problems. In addition to its numerous industrial uses, the SFT-110XW is well suited to the needs of colleges and universities. 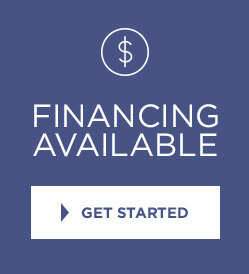 It is so affordable that it may be incorporated into teaching laboratories. At the same time, it is capable enough to be used for serious research. 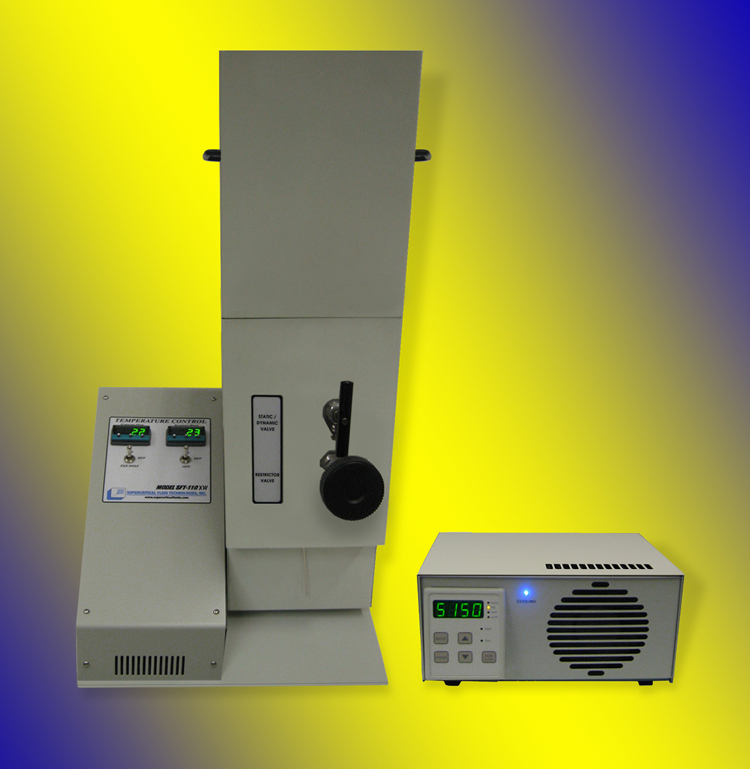 The SFT-110XW accommodates 5 ml to 500 ml extraction vessels. It may be operated at pressures up to 10,000 psi (68.9 MPa) and at temperatures ranging from ambient to 200°C. 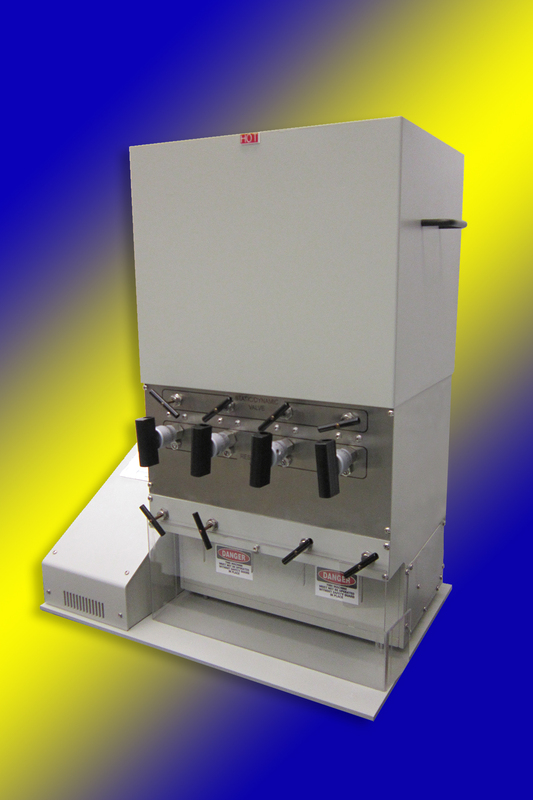 The wide range of vessel volumes available makes the SFT-110XW well suited to both analytical scale Supercritical Fluid Extraction applications and basic process development work. With a 500 ml vessel, the SFT-110XW can extract very low levels of key components from materials and process larger amounts of bulk material than would be possible with smaller, analytical scale SFE equipment. Inside the SFT-110XW’s oven, a preheater ensures that the temperature of the fluid reaching the extractions vessel is controlled precisely. This is essential to obtaining accurate, repeatable results. The SFT-110XW incorporates a high performance, dual piston pump which produces the high pressures required for supercritical fluid work. The system has built-in safety precautions to prevent accidental over-temperature or overpressure conditions. As an additional safety backup, a rupture disc assembly provides mechanical protection against accidental over pressurization of the system. Manually operated valves ensure long term, maintenance free operation. An integrated program logic controller monitors and adjusts fluid pressure inside the extraction vessel to achieve and maintain a desired set point. A PID temperature controller monitors and maintains the precise fluid temperature inside the high pressure vessel. A robust, variable restrictor valve (back pressure regulator) provides precise control over flow rates, which is essential in obtaining highly reproducible results from run to run. Flow rates can range from 0.01 to 24.00 ml/min. (0.08 to 18 grams/min) of liquid CO2 under typical operating conditions. While carbon dioxide is the most commonly used solvent, the SFT-110XW, with some modification, allows the user flexibility to work with a variety of supercritical fluids. Extract collection options include: solid phase extraction (SPE) cartridges, fractional cyclone separators, and EPA sample vials. 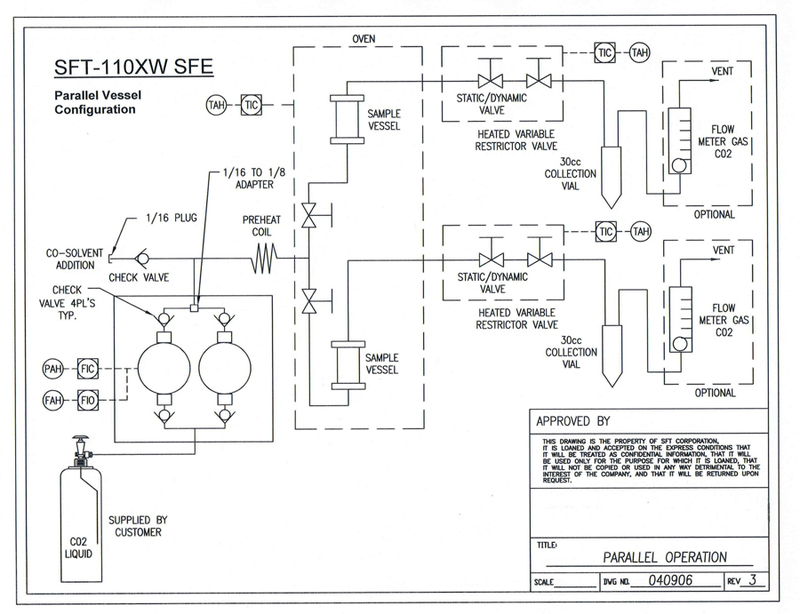 An optional co-solvent addition module is available for the SFT-110XW. Temperature and Pressure Display: Independent LED displays. Temperature Range: Ambient to 200°C. Operating Pressure: 10,000 psi upper pressure limit. Front keypad control, with LED display. “Constant pressure” mode of operation. 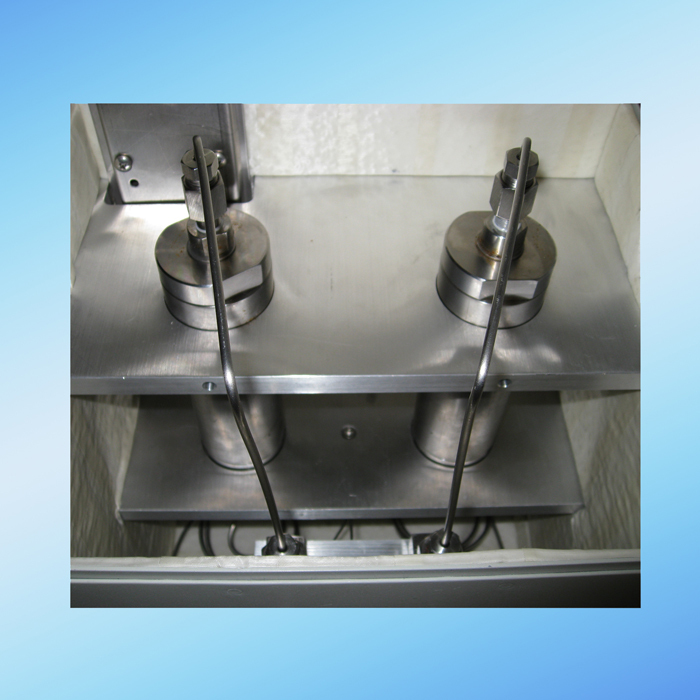 Flow Rates: 0.01 – 24.00 ml/min liquid CO2 (+/- 2% accuracy). Over Pressure Safeguard: High / Low pressure alarms and rupture disc protection. High Pressure Pump: Dual aluminum heads, furon seals and sapphire pistons, integrated thermoelectric cooling, cam-driven pump mechanism with single stepper motor dive, dual ball and seat check valves (ruby ball, sapphire seat, stainless steel fluid path, prime-purge valve, and pressure transducer. The pump’s constant pressure mode features a selectable pressure set point. Flow rate will auto- adjust to maintain pressure. Restrictor Valve: Heated up to 200°C; resistant to blockage. Extraction Vessel Sizes: 5, 10, 25, 50, 100, and 500 ml. Vessels come with 5 micro fritts and are interchangeable. Collection Vessel: Externally mounted. Many options available. Dimensions: Width: 40 cm, Depth: 57 cm, Height: 102 cm. Weight (with a 100 ml vessel): 32 kg (70 lb). Co-solvent Addition: Doping module or direct, in-line metered addition. Interchangeable Sample Vessels: 5, 10, 25, 50, 100 and 500 ml (with 5 micron Fritts). Sample Baskets: S/S mesh, with lids. Flow Meter: 0-9.5 SLPM of expanded gas. Power Requirements (Europe and Asia): 220 VAC, 50 Hz, single phase, 15 amps. Liquid Gas Supply: Bone Dry (99.99%) Liquid CO2 cylinder with dip tube. Alfatech S.p.A, in collaboration with Supercritical Fluid Technologies, Inc (USA) and the department of Environmental Sciences and Policies of the University of Milan, with the patronage of the Lombar..
© 2019 SFT, Inc. All Rights Reserved.